Now that Michaela's hair is so long, Mommy can do more with her hair. Michaela really likes to have her hair put in a ponytail. 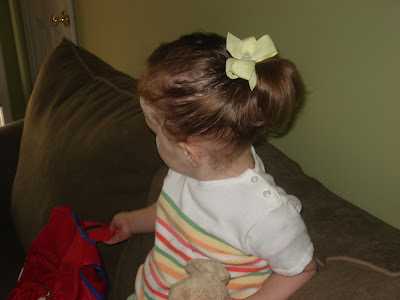 Mommy and Daddy think that Michaela looks like a darling little girl with her hair up. In these pictures, Michaela is waiting for Mommom and Pappy to pick her up and take her to the Phillies Game. 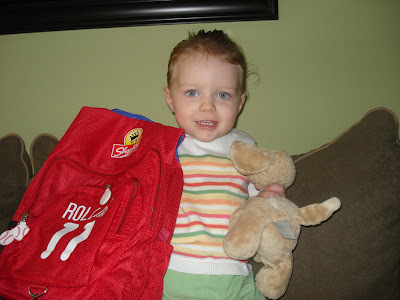 She is all ready to go with her Phillies Backpack and her doggy with her. I love the ponytail! Michaela is sooo grown up already! After all, she is almost two. I am so glad that Michaela has doggy with her. Is doggy the good luck charm for the Phillies? The backpack is just what every little girl needs to carry to the ballgames! I bet that it was the best time with Mommom and Pappy. Michaela, you are so sweet and very pretty. PS. We are REALLY hoping that the Red Sox and the Phillies are in the World Series together! If so, then we'll have to cheer from Maine to Delaware!! Yay for ponytails! Im sure that's so much easier to manage... just pull it up and go! Yeah right, if only it were that easy! :) Love you guys.. miss you! How cute! Her hair really has grown. Isnt it fun doing her hair in so many different ways, like a little doll. We had such a good time that night at the Phillies game...they won and you kept the pony tail in all night. Let's keep our fingers crossed that there will be playoof games to go to.